With things starting to look up financially and amid rumors of a successor to the Lumia flagship, the Finns shift down to speed up as they try to get one last lap out of the old Windows Phone generation. 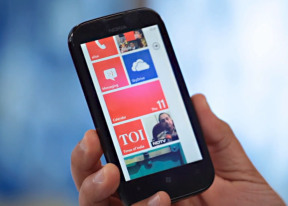 The Nokia Lumia 510 is old hardware running new old software, aiming to rally new users to the Windows Phone cause. Although Nokia hasn't given up on making the latest Windows Phone 8 available to the masses, nothing can negotiate a lower price than the modestly powerful previous-generation hardware of the Lumia 510. Yes, this is the cheapest Microsoft-powered smartphone by Nokia but also the first to release straight on Windows Phone 7.8 on most markets. Without pretending to completely bridge the gap to the seriously more advanced WP8, Windows Phone 7.8 offers some of the perks - mostly visual - of the latest OS version. There was even a half promise that it won't be the last update of the platform. This could be all the future-proofing a device like the Nokia 510 needs. It's an entry-level package that's supposed to break new ground for Microsoft and Nokia on markets where accelerated smartphone growth is just about starting. The Nokia Lumia 510 is basically the same package as the Lumia 610. The 510 has a bigger, 4" screen, which Nokia obviously considered important to the target audience. Given that most users are likely to be upgrading from Asha and the likes, we're willing to agree. However, to stay within budget, the Lumia 510 had to take cuts elsewhere. The inbuilt storage was halved - it's now a non-expandable 4GB. The camera has lost its LED flash too, but the limited storage is probably more troubling. Other than that, the hardware is lifted right from the Lumia 610. The two handsets are powered by the same Snapdragon chipset, with Adreno 200 GPU and the CPU clocked at 800MHz. Having tried the 610, we can confirm that the speed is reasonable - WP7 isn't too much of a resource hog so it fares surprisingly well on the four-year old hardware. Yet, Nokia's attempts to make Skype usable on that configuration proved futile. That aside, the Lumia 510 offers a more than decent smartphone experience with a full-featured office package, a free life-time SatNav license with maps available offline and an improved web browser. Best thing of all, it that doesn't cost a fortune. Interested? Read on.